By choosing a survival mode, you will definitely reach the point where resource extraction becomes very tedious. 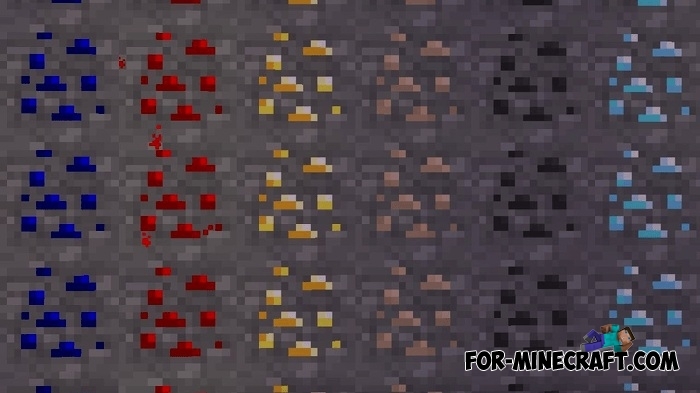 In particular, valuable ores such as gold and diamonds are the rarest of all and you, like any other player, will find it very difficult to find ore deposits. The Ore Radar mod was created in order not to dig 7 layers of ground, and then not break the stone blocks in search of something valuable. It works on the principle of a metal detector that reacts to metal objects. Just run Minecraft PE and go to either side. After some time (usually valuable ore is everywhere, but it is very difficult to find it because of the great depth) you will see the found block. In the center of the screen there is information about the ore: the name of the block and the coordinates. Stop at that place and dig down and breaking a certain number of blocks you will reach valuable ore. Also, do not go too early, try to break the neighboring blocks, as in most cases ore in Minecraft is generated from two or more blocks. How to install the Ore Radar mod?